Microsoft's Paint 3D tool is used mostly for manipulating and creating 3D models but you can also start with a 2D picture and perform a little magic, as described below, essentially "converting" a 2D drawing into a 3D object. Unfortunately, the process for doing this in Paint 3D isn't as simple as a tap on a 2D-to-3D button (wouldn't that be nice!). Making a 3D model from a 2D image might involve copying parts of the image, using a brush tool to paint on colors and designs, rotating and positioning 3D objects, and more. 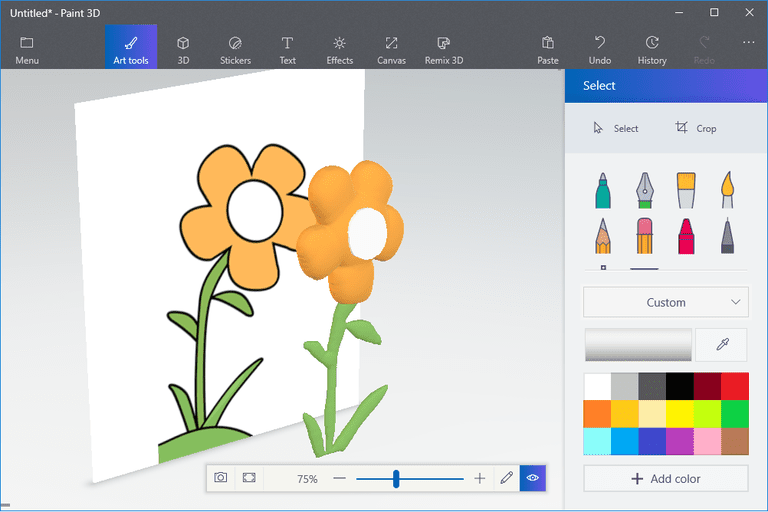 Go into the Canvas section of Paint 3D and drag the boxes surrounding the canvas, or manually adjust the width/height values, to ensure that the canvas can support not only the 2D image but also the 3D model. Doing this makes it much easier to sample the 2D picture so that you can apply the same colors and shapes to the 3D model. Since we're making a 3D model from a 2D picture, we need to copy the shapes and colors from the picture. We'll do this one component at a time. In our example with this flower, you can see that we first outlined the petals with the soft edge 3D doodle tool, and then did the same with the stem and leaves. Once the image has been traced with the 3D tool, drag it off to the side to build the 3D model. You can do fine-tuned adjusting later. For now, we just want the different parts of the 3D model to exist off to the side. It's easy to compare the 2D and 3D images because we've placed them right next to each other. Use that to your advantage to quickly identify the colors and specific shapes needed to recreate the picture in 3D. In the Art tools menu are several tools that let you paint and draw directly onto the 3D model. Since we have a simple image with easy colors and lines, we'll use the Fill bucket tool to paint large areas at once. The Eyedropper tool just below the drawing utensils is for identifying a color from the canvas. We can use that, along with the Fill tool, to quickly paint the flower the same colors seen in the 2D picture. You can use the Stickers menu to select components of the 2D image, and then the Make 3D option to make it jump off the canvas. However, doing so will not make the image truly 3D but instead just push it off of the background. It's also important to recognize the 3D qualities of the image like flatness, roundness, and other characteristics that aren't necessarily clear from looking at the 2D version. Since we know how flowers look in real life, we can select each of its parts and make them rounder, longer, thicker, etc., based on how an actual flower looks. Use the same method to adjust your 3D model to make it more life-like. This is going to be unique for each model, but with our example, the flower petals needed fluffing up, which is why we used the soft edge 3D doodle instead of the sharp edge, but then used the sharp edge for the center section since it's not really the same substance. This step can be difficult if you're not already familiar with how to move objects around in 3D space. When selecting any part of your model, you're given several buttons and controls that let you resize, rotate, and move them within the canvas. As you can see in our example above, the stem could be moved freely into any position, but to make it look more like a real flower, it has to be behind the petals but not too far behind or we risk the two not connecting at all. You might find yourself constantly switching between the Edit and View in 3D mode from the bottom of the canvas so that you can see how all the different parts look when seen as a whole. To get the 3D model out of the canvas that contains the 2D picture, just go back into the Canvas area and use the crop tool to section off what you want to keep. Doing this lets you export the model to a 3D file format without having the original image stuck on the canvas background.